West Ham United will auction all match-worn shirts from this weekend’s London derby against Tottenham Hotspur, with all proceeds going to the victims’ families and survivors of this week’s devastating Mexican earthquake. The Club will then double the figure raised by the auction, before donating the total amount to an appeal organised by Hammers striker Javier Hernandez and his fellow Mexico international Miguel Layun to aid the relief effort in Mexico City and the surrounding area. The devastating 7.1-magnitude earthquake struck southern Mexico on Tuesday, leaving thousands of families homeless and killing more than 200 people, with the death toll expected to rise significantly. 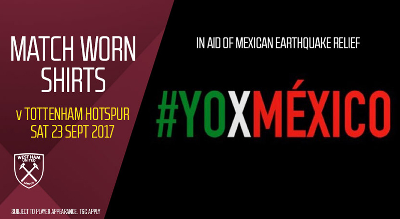 West Ham’s Chicharito and Porto’s Layun have announced the #YoXMexico initiative to aid their compatriots by raising funds that will help deliver food and supplies to those most affected by the disaster, via Red Cross and Los Topos, an organisation specialising in cleaning debris. “We have all been moved by the news and devastating effects of Tuesday’s earthquake in Mexico,” said joint-chairman David Sullivan. “While disasters like this can seem very far away from us, it is important that we still help where we can. “Javier has joined forces with Miguel Layun to raise funds to help his fellow countrymen in their time of need, and we hope this auction will be able to raise a significant amount which can go towards their fund. Hammers striker Chicharito said, “Being so far from Mexico and seeing the suffering of our compatriots in the distance has been very painful. The auctions are now underway at officialwesthamauction.com with shirts of the players who featured against West Bromwich Albion available. However supporters will be bidding on match-worn shirts from the Tottenham Hotspur game on Saturday 23 September. Winners of the auction will be able to decide after the conclusion of the auction whether they would like their shirt signed by the corresponding player or left unautographed. Any supporter who purchases a player’s match-worn shirt and the player does not feature in Saturday’s squad, will then receive a match-worn shirt from the next game where the player features. The auction will last for seven days and will end at 5pm on Thursday 28 September. Once an auction ends the winning bidder has three days to pay. If they decide to not pay then the opportunity is then passed onto the next highest bidder.